This is the first in series of painting representing kids books. 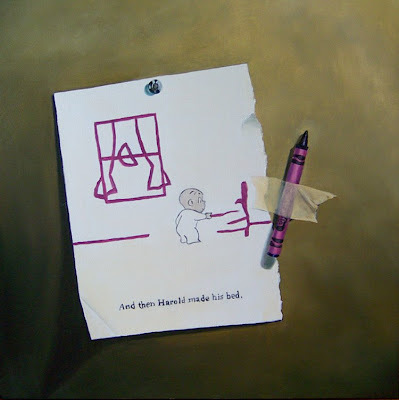 I loved the Harold and the Purple Crayon books as a kid. Maybe it was because Harold created his life with his artwork, and that is sort of what I try to do. I had a heck of a time trying to get a good picture of this piece to post. The paint is still wet and some of it caused a glare in the photo. I will probably rephotograph it when it is totally dry and repost the photo. These "KIDS BOOKS" paintings will be available for custom orders too, if anyone has a favorite book they would like featured in a painting. This is 12x12 on hardboard and is 3/8 inches thick. I LOVE THIS PAINTING! One of my all time favorite books!